A highlight of my reviewing life in the 1990s was the time I spent driving my then-reference B&W John Bowers Silver Signature loudspeakers with the Pass Labs Aleph 3 amplifier. As I wrote in an April 1997 Follow-Up, this little single-ended MOSFET amplifier offered "wide, deep, detailed soundstages; a delicious presentation of recorded detail without the sound getting in-your-face; a purity of tone that became addictive; and an ability to go sufficiently loud (in my room with my speakers) that belied the 30Wpc specification. And when the Aleph 3 did clip, it did so relatively gracefully." Class A in Stereophile's "Recommended Components" listing was my verdict for the Aleph 3, but for reasons I can't pin down, I didn't audition another Pass Labs component until the end of 2012, when I was bowled over by the sound of their XP-30 line preamplifier. As I described in my April 2013 review, the XP-30 paradoxically sounded superior to no preamplifier at all. Impressed, I asked for a pair of review samples of Pass Labs' XA60.5 monoblocks ($11,000/pair). Whereas the Pass Labs preamplifiers are designed by Wayne Colburn, the power amplifiers are the work of company founder and high-end audio veteran Nelson Pass, who even lays out his own circuit boards. The X-model amplifiers, beginning with the X1000 in 1998, were the first implementation of Nelson Pass's patented Supersymmetry topology (see "Nelson Pass on the Patents of Pass"). The XA series, which debuted in 2002, combined Supersymmetry with the single-ended class-A operation of the Aleph series. The XA.5 models offer detail improvements over the XAs. Supersymmetry was described in US Patent 537689, Amplifier with gain stages coupled for differential error correction, granted in 1994: "An object of the invention is to provide a high fidelity amplifier that accepts both balanced and unbalanced input signals, amplifies the input signal with as little added distortion and noise as possible, rejects common mode noise components of the input signal, and produces a balanced differential output signal. . . . [T]he above object is met by an amplifier circuit having two identical inverting amplifier stages that are coupled together in such a way that the amplified signal output from one stage is fed negatively to the other stage so as to be reinforced differentially at the output of this other stage, while distortion and noise contributions by an amplifier stage to its output are fed positively to the other stage so as to be recreated in common mode at the output of this other stage. Thus, the input signal is amplified and provided on balanced differential outputs with the common mode component unamplified, while any amplification errors contributed by the amplifier stage appear in common on both outputs and are thus differentially cancelled." This simple topology is common throughout the Pass line, the major differences being in the power supplies and biasing. Nelson Pass described the circuit used in his XA-series amplifiers in an article available here: "We approached the development of the XA series with an eye to creating a warm/sweet X amplifier, or conversely, a powerfully dynamic Aleph. The successful result is a circuit which is described as balanced, single-ended class-A, consisting of two balanced Aleph amplifiers sharing a single differential input pair of transistors. "The amplifier has only the two stages, an input stage of a balanced pair of input MOSFETs, and the output stage, a balanced pair of single-ended class-A power MOSFETs. . . . Feedback is used only to set the gain and correct for dissimilarities between the two matched output stages. There are no adjustments. There are no frequency-compensation capacitors. The amplifiers are unconditionally stable and reliable into any load. . . . The XA amplifiers operate at approximately 33% efficiency, that is to say they idle at three times their rated output." Pass elaborated on this description in a conversation with Stereophile's Brian Damkroger while Brian was preparing his May 2009 review of the XA30.5 stereo amplifier: "In the XA.5 amps the bias is set quite high, so that the output stage operates in class-A up to the rated output and emulates a single-ended amplifier at low levels." The circuit topology is "a push-pull output stage in parallel with a constant current source. The n channel, which handles the push, or plus, side of the push-pull, is biased at a higher level than the p, or negative channel. At very low power levels, the p channel doesn't see the current source and the output is effectively that of the n channel functioning in single-ended mode. At higher levels, both n and p devices contribute to the output as a push-pull pair, operating in class-A mode up to the amp's rated output and class-AB beyond that point." Pass Labs' XA amplifiers therefore offer the promise of allowing their owner to have his single-ended, class-A cake, and eat it at high powers, too. The XA60.5 . . .
. . . is the next-to-bottom model in Pass's XA line. 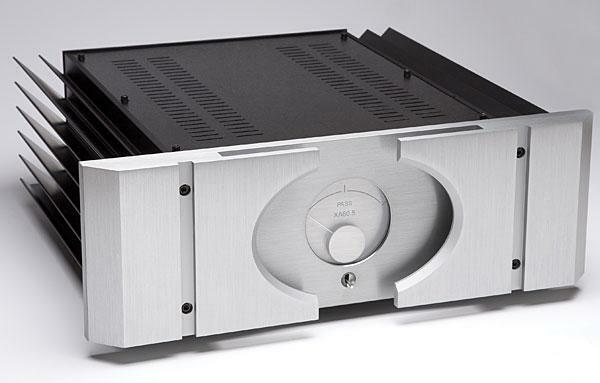 A monoblock housed in the same case as the XA30.5 stereo amplifier, its sculpted, gray-anodized aluminum fascia cleverly incorporates handles, and is dominated by a large, blue-illuminated meter that indicates the output stage's current draw. As there is a substantial bias current, the meter's needle points resolutely upward, with no motion until the output current exceeds the bias and the amplifier starts to operate in class-AB mode. The rear panel of the black-painted aluminum case has the same two pairs of binding posts as the stereo amplifier, but wired in parallel to facilitate speaker biwiring. A third pair of binding posts is used for 12V trigger operation, while there is a single XLR input jack, and an RCA jack wired in parallel with pins 1 and 2 of the XLR, for single-ended input signals. The sides of the chassis comprise the massive heatsinks required for class-A output-stage operation, these in the form of angled "wings" rather than the usual vertical fins. The XA60.5's interior is dominated by a large Plitron toroidal power transformer mounted behind the front panel. This is flanked by two circuit boards running the full depth of the amplifier, each carrying 10 pairs of complementary power MOSFETsway more than you'd have thought necessary for an amplifier rated at 60W. If you consider that class-A operation up to 60W into 8 ohms requires a constant DC bias current of just under 2A (according to a quick, back-of-the-envelope calculation), dividing this current among so many devices results in very little thermal stress on each. Nelson Pass says that the actual chip temperatures are about 70°C (126°F) below their rated maximum. But with that much bias current, a class-A amplifier will run hot, "about 25°C [45°F] above ambient," according to Pass. Three circuit boards occupy the real estate at the rear of the chassis. On the big, bottommost board are 24 large, electrolytic power-supply capacitors and a couple of devices, presumably voltage regulators, mounted on tall heatsinks. The small, topmost board carries the XA60.5's input stage, and is supported by a slightly larger motherboard that appears to contain the output bias-setting circuitry and other housekeeping components. The connections from the power supply to the output stages and from those to the output terminals are implemented with large-gauge wire rather than the copper bus bars seen in some other high-end power amplifiers. But with the XA60.5's relatively modest power output, this will not be an issue. The XA60.5's exterior design was the work of Pass Labs president Desmond Harrington, who told me he moved from Krell to create "temples for Nelson's designs." I used the XA60.5s for my review and for recreational listening over a period of three months. There was an unavoidable gap in the summer, however, when my listening room, which lacks air-conditioning, was not a comfortable environment for amplifiers that run as hot at the XA60.5s. I was fortunate enough to be able to use two superbly transparent loudspeakers with the Pass Labs: Wilson Audio Specialties' Alexias (reviewed in December 2013), and Vivid Audio's Giya G3s (to be reviewed in the spring). My auditioning comments are based on my experiences with both pairs of speakers. "Nelson Pass says that the actual chip temperatures are about 70°C (158°F) below their rated maximum. But with that much bias current, a class-A amplifier will run hot, "about 25°C [77°F] above ambient,"
Thank you for the corrections. Looks like we erroneously added the extra 32° in both cases, confusing Celsius degrees with degrees Celsius. Now that you've reviewed both the CP-800, & XA-60.5s, do you think that the two devices would have a good synergy together? Hey John, hope you are fine! Do you mean the best for this price or the best overal? Comparing XA60.5 with your past reference 33H what is your thoughts? Do you mean the best for this price or the best overall? Best overall. Although other amplifiers exceed the Pass Labs in one or two areas, the XA60.5 offers the best balance of qualities. Comparing XA60.5 with your past reference 33H what is your thoughts? Sadly, one of my No.33Hes has been broken for the past 5 years and I haven't been able to afford to get it fixed yet. I couldn't perform direct comparisons, therefore. Is it possible an amp so old like 33H to compare with something so new with all these new materials and design? I think that 60,5 probably outperform 33H in every way with no direct comparisons needed at all. Dont you? I think that 60,5 probably outperform 33H in every way with no direct comparisons needed at all. Dont you? Without being able to make the comparisons, I think it foolhardy to conjecture what the differences between the two amplifiers might be, let alone rank them. Thanks so much for the great review. I have a quick question, Do you recall if the front meter was contantly moving when driving the Alexias at normal listening levels? (e.g. around 70-80db). Did you feel like the XA 60.5 had enough power for the Alexias or did you feel like a higher XA, such as the XA100.5, would be a much better match? Thanks for your insight, really appreciate your feedback. Do you recall if the front meter was contantly moving when driving the Alexias at normal listening levels? (e.g. around 70-80db). No, the meters remained steady at the central, bias position. Did you feel like the XA 60.5 had enough power for the Alexias? In my 27' x 16' room, yes. What are your thoughts regarding either the 30.5 or the 60.5 running Genesis 500 speakers? I'd love to gain the sonic qualities these have and with the 500's being self powered on the bass, I'd like to think it might be possible. Match made in Heaven ? Impedance. I have Dunlavy SC-V but no manual or any technical info. Will this amp work with those ? This implies that a single XA30.5 and a pair of X60.5 amps will both put out 130W per channel), making the stereo chassis twice as powerful as a single xa60.5 monoblock chasis. You mentioned that the XA30.5 is a full 6db more powerful than its rating, but it looks like the XA60.5 is measuring only 3db more powerful than it’s 60w rating. Your 4 ohm measurements were reported similarly. On the 2 Ohm measurements, you actually state the XA30.5 was driving a single channel, so that result looks consistent. What are the correct values? Were the numbers for the XA30.5 actually for a single channel?